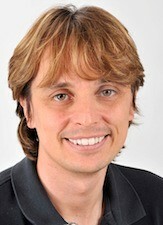 Dr Del Bene heads the lab of Neuronal Circuit Development in Curie Institute in Paris since 2010. His lab is interested in studying the formation and function of the visual system of zebrafish larvae using in vivo time-lapse microscopy and state-of-the-art “connectomic” and “optogenetic” approaches to monitor and perturb neuronal activity. Dr Del Bene completed his PhD at EMBL in Heidelberg in 2004, after 4 years in the Laboratory of Prof. Jochen Wittbrodt, followed by a postdoc in the lab of Prof. Herwig Baier, in the department of Physiology, UC San Francisco. Recently, his group has successfully optimized highly efficient CRISPR/Cas9-mediated knock-out approach in zebrafish.